Cairn erected to the Strzelecki expedition which passed throught the area in 1840. At the unveiling of the Bulla memorial for Hume and Hovell,Charles Daley the Secretary of the Victorian Historical Society suggested that the idea be extended to other explorers and a committee was formed to mark out the routes of Charles Sturt, Thomas Mitchell, Angus McMillan, and Paul de Strzelecki. 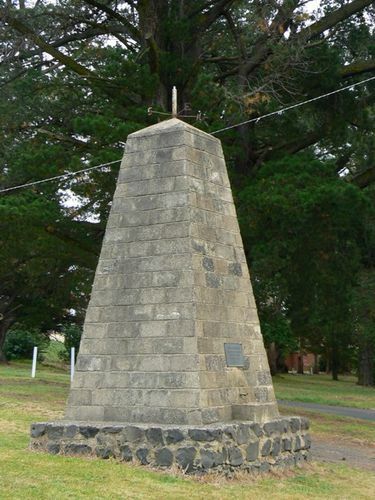 Seven cairns or tablets to Strzelecki were erected at Heyfield, Loy Yang, Koornala, North Mirboo, Leongatha, Korumburra, Corinella. Of This Spot May, 1840.